Your webmaster will admit it: I haven’t bought a CD in a couple of years, though I still have a CD collection numbering about 400 and an LP collection of approximately 250-300, and I still play a lot of them regularly. The past couple of years, though, 99% of my music buys have been online through amazon or the apple store. In many ways the record market has gone back to what it was in the 60s and 70s when 45RPM singles pushed the industry. With digital downloads, every song is now a single, and you can buy songs individually without getting 8 duds at the same time. With mp3s and digital downloads, you sacrifice album art and lyrics printed on the LP jackets; for a fan of typefonts and graphic design like me, that’s quite a loss. (I think the last new LP that I bought that wasn’t a vintage release unavailable on CD was REM’s 1988 LP Green.) 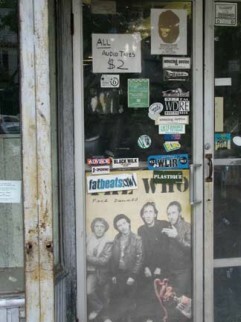 That said, I was a frequent denizen in Sounds on St. Mark’s Place (where the clerks sat really high at the front of the store, as if passing judgment on your selections), Venus on West 8th between MacDougal and 6th (where I snagged several Soft Boys LPs; I was hooked after hearing Underwater Moonlight on a comp tape in December 1982) and Midnight Records on West 23rd near 8th Avenue, long gone but still an online entity. 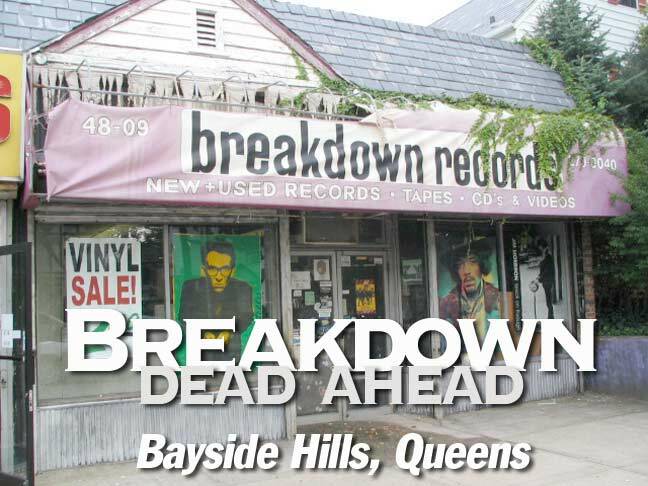 Breakdown Records is in Bayside Hills, actually the southern portion of Bayside, a large neighborhood in northeastern Queens (I’ll have a larger treatment of Bayside in the offing). 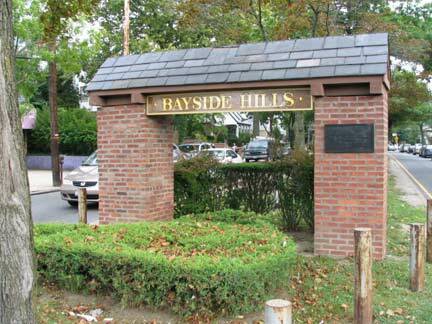 Bayside Hills is the rectangle described by Northern Blvd., the Long Island Expressway, the Clearview Expressway, and Springfield Boulevard. 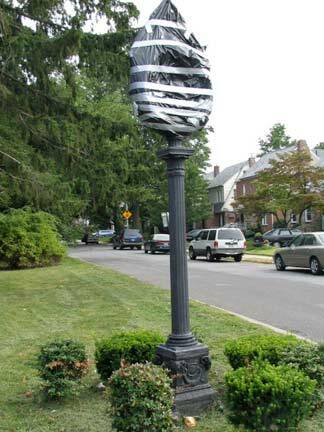 It’s largely a quiet neighborhood with separate homes with wide lawns and yards, and many of the streets have center green medians. Of course, there are incursions of modern development happening, which means concrete lawns, exposed air conditioners and meters, and unimaginative construction. 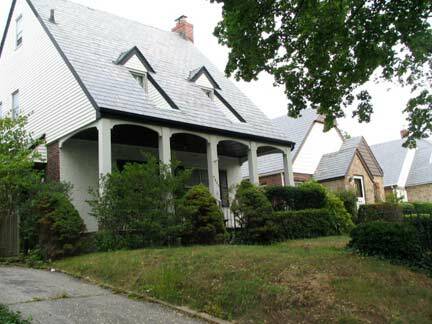 There are also surprising pockets of rurality remaining in Bayside Hills, and even a couple of samples of notable architecture around. The map above is from a 1909 Bomley atlas of Queens, showing the Bayside Hills area, with modern road names added in red by me. 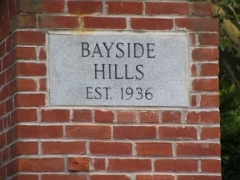 This was a few decades before the name “Bayside Hills” was applied to the area, and it was largely a collection of farms and estates punctuated by a few main roads; surprisingly, most of the roads are still there, although in altered form. Rocky Hill Road was the main path through the region; it separated form Queens Avenue (today’s Hollis Court Boulevard) and rolled east, making an abrupt turn south at today’s Dermody Square (see below) and then ran south to Jamaica Avenue along the paths of today’s Luke Place, 56th Avenue, Springfield Boulevard and Braddock Avenue. 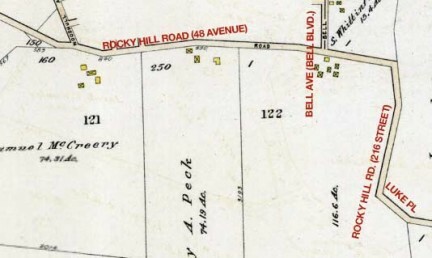 Today, a 2-block stretch of Rocky Hill Road remains, branching off 47th Avenue at 201st Street and running to the Clearview Expressway, where it becomes 48th Avenue. 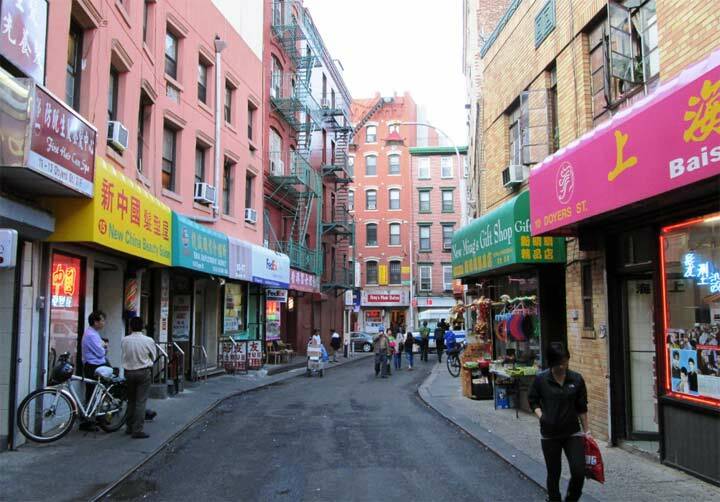 See this page for the full Bomley atlas, a fascinating look at Queens when it was the Wild East. 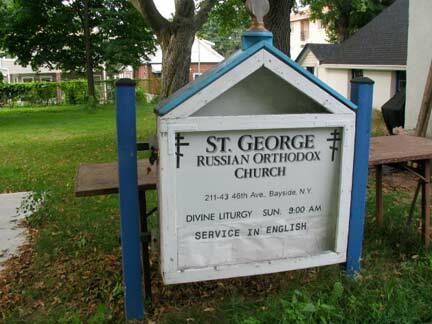 St. George Russian Orthodox Church is a small country church along 46th Avenue between 211th and 212th Streets near bustling Bell Boulevard. 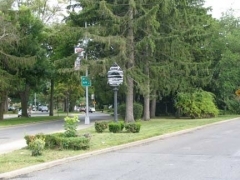 It’s tucked away just south of pedal to the metal Northern Boulevard, which was an Indian trail, then a tolled road, and now Route 25a to eastern Long Island. Little bit o’ Seoul. 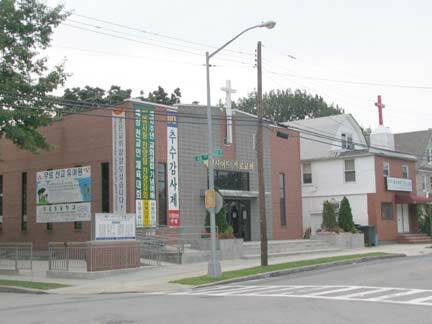 Korean church, 46th Avenue and Oceania Street. The name of the street is mysterious to me. 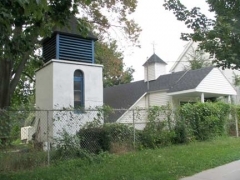 It stands in for 209th Street and turns up on maps as early as 1927. It doesn’t reach as far as the East River, the closest body of water to any ocean. 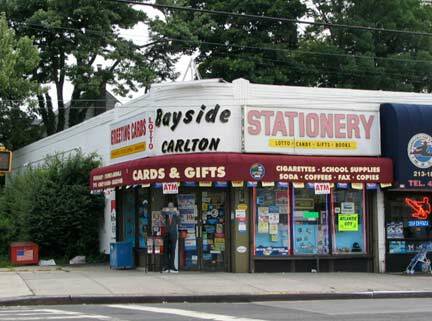 Commercial strip, Bell Blvd. and 48th Avenue, SW corner. The detailing and curved corner marks the structure as probably from the 1920s or 1930s. Bayside hills “gatehouse,” south side Bell Boulevard at 48th. 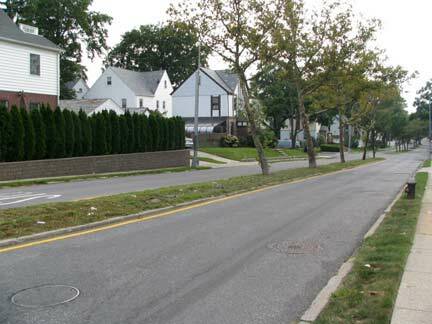 Bell Boulevard takes on a decidedly suburban character between 48th Avenue and the Long Island Expressway, with a center median and plenty of street trees. 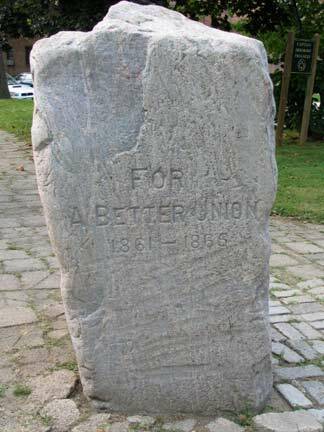 The road does not honor Alexander Graham Bell, as many suspect, but shipping merchant Abraham Bell, who purchased about 250 acres in what is now Bayside in 1824. 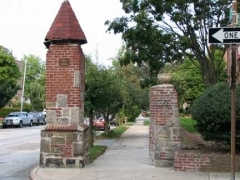 Bell Boulevard (at first named Bell Avenue) was once the dividing line between his two farms. 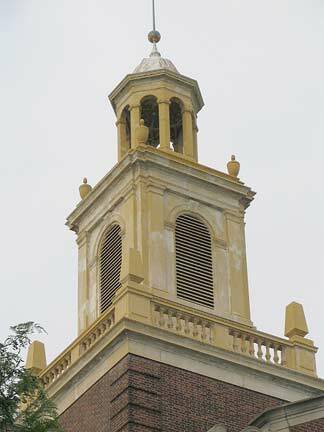 Bell’s mansion on Bell Blvd. 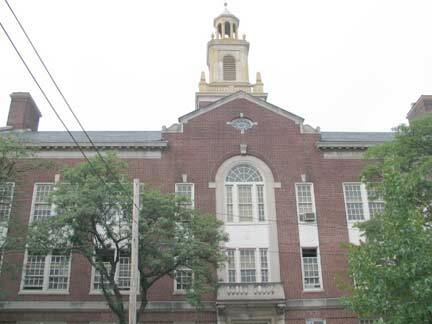 and 39th Avenue remained standing until 1971, when it gave way to a building now home to a Tiger Schulman judo school. 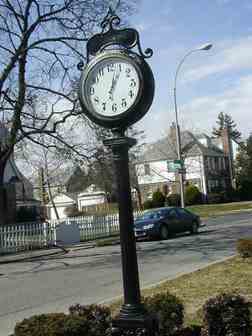 When I last checked, the Bayside Hills street clock, at Bell Blvd., 50th Avenue and 214th Street was out of commission, possibly a vandalism victim; anything that stands out as beautifully as this clock does attracts miscreants from all over eastern Queens and possibly borough-wide. 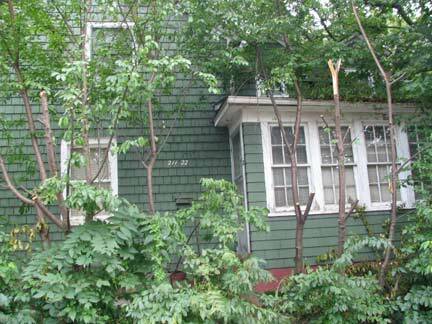 Fear not, I snagged a photo of it in March 2002, when it was yet un-wrecked. 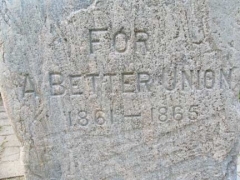 I hope it gets fixed soon. Emily Stern has a whole website devoted to them. Porched Bell Blvd. 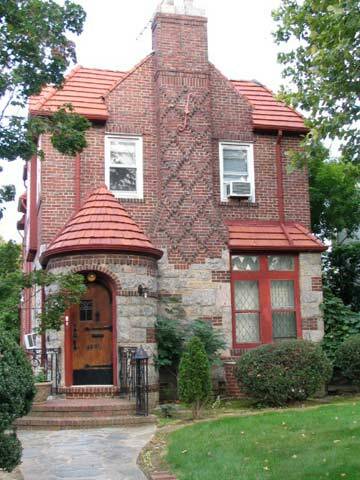 house with “hidden” dormers, and median-ed 50th Avenue. 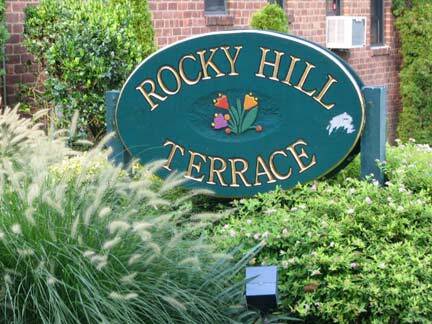 The Rocky Hill Terrace Houses, 48th Avenue east of 215th Street, is a canny tribute to 48th Avenue’s former name, Rocky Hill Road. 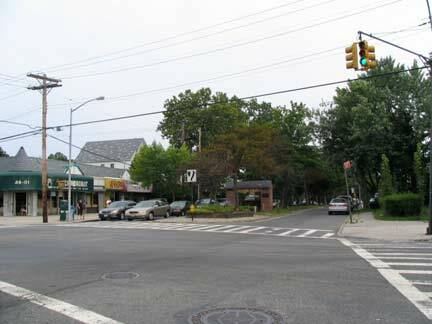 48th Avenue splits in two at 216th Street,with the right side curving to meet the cross street. 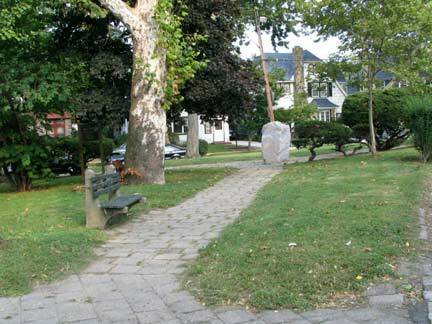 This marks the point where Rocky Hill Road made an abrupt jog south, on its way to Jamaica Avenue. 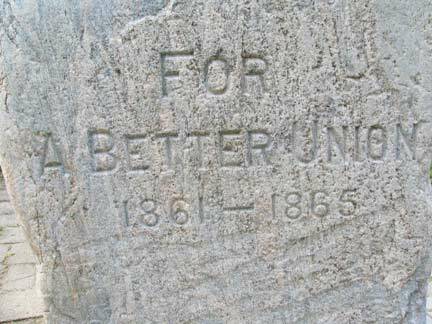 At the triangle park formed by the split, you’ll see a large uneven boulder in the center, inscribed “For a Better Union 1861-1865.” The triangle honors Captain William Dermody, an outspoken abolitionist who was mortally wounded at the Civil WarBattle of Spotsylvania, VA in May 1864. A collection of handsome Tudor-style buildings is clustered along 48th Avenue from 216th Street east to Springfield Boulevard, complete with casement windows and arched doors. The distinctive, if deteriorated, gatepost states this particular section was built in 1936. 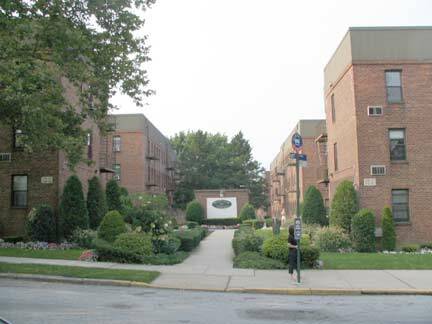 As I’ve said Bayside Hills, and much of eastern Queens, provides pockets of rurality in the big town. 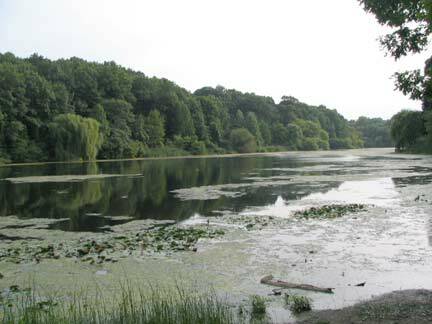 Oakland Lake, just below 46th Avenue between Springfield and Cloverdale Boulevards, is the largest of Queens’ small ponds and lakes, save Kissena Lake and Meadow and Willow Lakes in Flushing Meadows-Corona Park. 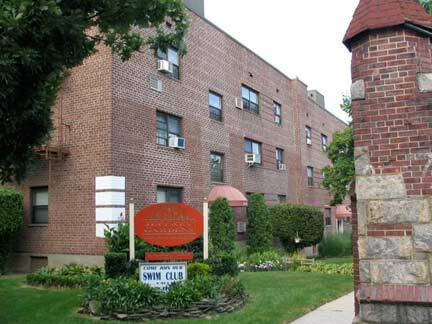 In 1896 John Taylor, who by then owned the old Lawrence lands, organized the Oakland Golf Club, and in the 1960s NYC bought the club and built Queensboro Community College, Benjamin Cardozo High School, and PS 203 on the old property just south of the lake. 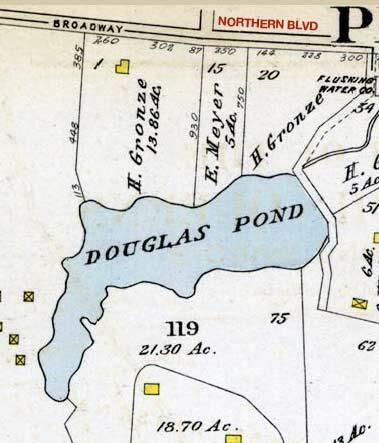 From the ForgottenBook: Oakland Lake is the largest of a number of small “kettle ponds” left over from the passage of a glacier that stopped its southern progress in the middle of Long Island 15,000 years ago. According to the NYC Parks Department, it was once thought to be fully 600 feet deep, but the lake bottom was found to be just 20 feet in 1969. 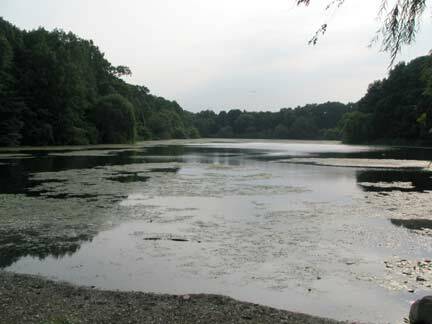 Similar to what was done with Kissena Lake, Oakland Lake was surrounded with a concrete lining and “citified” in the 1930s. 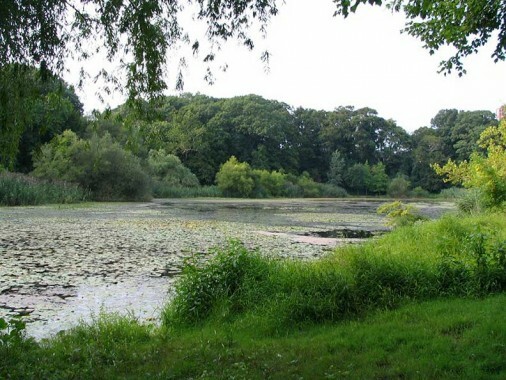 After lean years in which the lake’s condition deteriorated, a revitalization effort was spearheaded by local resident Gertrude Waldeyer (1908-1987), whose Oakland Lake and Ravine Conservation Committee raised $1 million to restore the lake to its natural state. 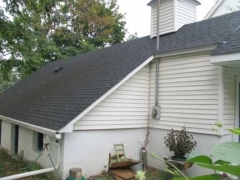 It is now home to catfish, sunfish and carp. The pedestrian promenade ringing the lake is named for Ms. Waldeyer.